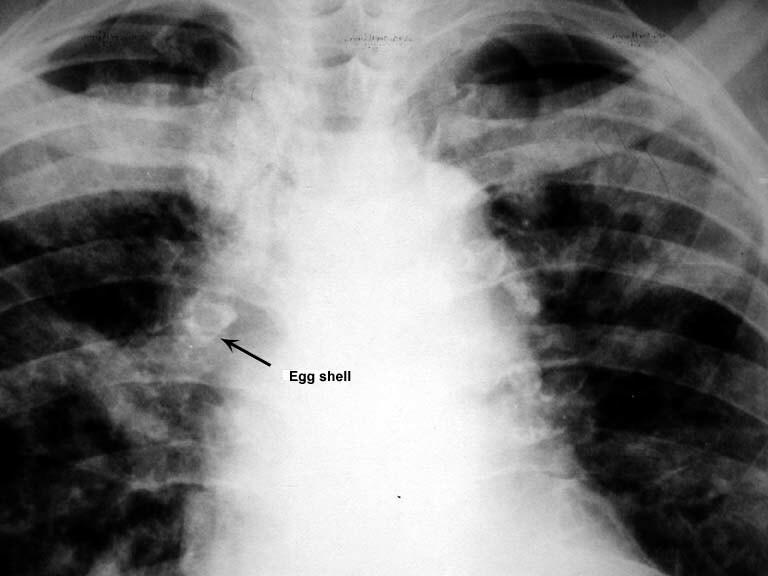 Egg shell calcification of the hilar nodes is seen in which among the following? Silicosis results from exposure to free silica (crystalline quartz), which occurs in mining, stone cutting, abrasive industries (e.g., stone, clay, glass, and cement manufacturing), foundry work, and quarrying. Longer-term exposures can result in simple silicosis, with small rounded opacities in the upper lobes of the lungs. Calcification of hilar lymph nodes can give a characteristic “eggshell” appearance. Progressive nodular fibrosis can result in masses >1 cm in diameter in complicated silicosis. Due to impaired cell-mediated immunity, silicosis pts are at increased risk of tuberculosis, atypical mycobacterial infections, and fungal infections. Silica may also be a lung carcinogen.